Song writing collaboration has yielded some of the world’s greatest hits over the past decades of popular music. In Australia we have had our fair share of global success with composers such as Vander and Young, Birtles and Goble of Little River Band, AC/DC’s Young, Young and Scott, and Savage Garden’s Hayes and Jones, to name just a few. Amongst these greats must be included the writing collaboration of Michael Hutchence and Andrew Farriss who first took the world by storm in the 1980’s with their fresh style of dance funk. Collaboration is a challenging, rewarding and possibly disparaging exercise in which both parties bare their creative soul. But it also has the boon of having another value your music enough to believe in it and want to be part of birthing it to life. As we sadly approach the 7th anniversary of Michael’s departure we decided it was high time we completed another article on how Michael composed a song. To make this an authentic article we couldn’t really do it justice without inviting Michael’s long-time writing partner, Andrew Farris, to share how he and Michael worked together to produce some of the world’s greatest pop music of the past 25 years. We have found an earlier, previously “not-for-release” song in which we can explore some of the developments that take a Farris/Hutchence composition from initial ideas to a mastered song ready for the airwaves of the world. We wish to express our appreciation to Andrew Farriss and INXS, David Edwards, Nathan Hull and Dan Jones for their assistance in the preparation of this special article and the exclusive interview with Andrew conducted on our behalf by Nathan and Dan. We commemorate all of the new articles and sound files, in loving memory of our dear Hutch. It’s a warm April day in Miami, Florida. There was a full moon in the sky just before the sun rose at 6:47 am over the rooftop of Gloria Estafan’s studios, Crescent Moon, near the Miami International Airport. By mid morning Audio Engineer Scott Perry and his Assistant, Sean Chambers are preparing for a session in the studio. The two have worked regularly in Crescent Moon in what is fast becoming the Latin Pop Capital and home to the famous Miami Sound. A number of International Guests will be dropping in to use the studio today. 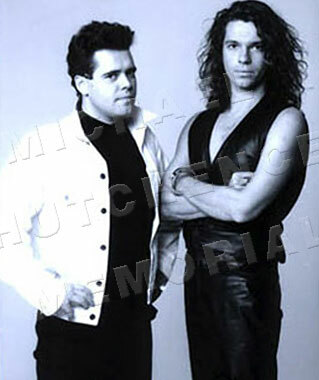 Michael Hutchence and Andrew Farriss, given a free day from the INXS “Dirty Honeymoon Tour” are preparing to lay down a demo track of a new song for their upcoming “Greatest Hits” album. Andrew has presented Michael some ideas with a catchy four bar synth loop. The groove uses guitar sounds and percussion to a sustained drone E. While still in it’s planning stage they have enough lyrics and melodic ideas for Michael and Andrew to lay down a developing demo track. It is a work in progress. In a couple of days they will be heading to shows in Venezuela, so time is of the essence. Even when it’s a day off from hard gigging, the writing has to continue. There is an album to get out. On the other side of the country the Late President Nixon is being laid to rest, and on the other side of the world Nelson Mandela is casting the very first non-racial democratic vote in the history of Africa. In Beijing, students are gathering to commemorate the first strike for democratic freedom. It’s five years to the day when students took over Tiananmen Square. This day is 27th April, 1994 and it is destined to become a celebration around the world. It will be known as “Freedom Day”. 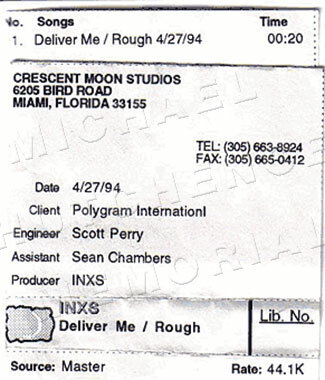 The INXS song being forged in the Miami Studios that freedom afternoon is intriguingly called, “Deliver Me”. Michael’s Official Memorial Site, in conjunction with INXS.com have for the first time anywhere in the world been able to release the demo track of “Deliver Me” that was laid down on that warm April day. It was to become the first of three studio recordings of the song. This first unreleased version was produced by INXS, the second by George Martin’s son, Giles Martin (see Andrew’s Interview) and the final version (audio included below) was produced by INXS and Chris Thomas in London, later that year. With the production crew in place, and Michael circling the large studio microphone, the tape is rolled. Andy is riding high on some great concert performances and the creative juices are really flowing. He is able to use some new patches that have come out of his constant searching through synth and sampler banks for fresh innovative sounds. So take a listen to the raw version of “Deliver Me”, and read on. Andrew sets up the groove, and in the studio booth, smiling heads nod approvingly in time with the back beat. The track begins with a short drum intro, then the four bar loop is repeated before Michael bursts in with his new lyrics, “Deep down is a mystery, And all I wanna know is why”. His voice is sounding raspy from constant touring, yet this is the seasoned voice that only comes from continual gusto rock performances. It has reminiscent Jaggeresque tonal qualities as Michael focuses his entire energy into the performance. The lyrics are passionate, sensual, raw and the vocal fervor builds over the almost hypnotic loop. It’s a catchy, octave-jump riff with a pleasant upward harmony slide on guitar, punctuated with tom tom fills over a straight 8 beat. A well-placed slide down on bass guitar and more tom tom fills add variety and contrast as the dance groove builds. Some harmonic padding is added on the second verse with a sustained string pad on the third as Michael delivers “I smell you on my finger tips, I hear your whispering.” It’s great to hear his raw voice with little studio coloration. But some lyrics won’t make it to the final version and so we hear for the first and last time, “You see me sweatin’ like a pig and my eyes are lookin’ strange”. You have to smile at Hutch’s lyrics. Did he forget this line in the final version or did he just decide, “Nah!”? His vocal delivery is intentionally rhythmical, helping to create the captivating groove. He breaks for four bars for what will later be added as an embellished instrumental interlude and when he reenters with the chorus, the Engineers dub his voice with deep tape echo… “Deliver me, deliver me…” The song is now needing to reach a climatic point and Michael works hard to bring it to a peak. But with such an economy of harmonic background, simply put… one chord, (quite acceptable actually in a song that is working on groove) Michael finds it hard to lift it into a contrasting sound that will create an appealing hook. Andrew will work on it; he tells Michael. It just needs a fresh chord to take it to a new level in the chorus. Of course if this was a 70’s arena band they would just blow away the ending with a way out guitar solo that would allow the singer to insignificantly exit stage left. But INXS is about an economy of great guitar, sax and synth sounds. It’s about great drum and bass grooves and predominantly Michael’s unique vocal prowess. Now listen to the song take on a new dimension in the final version as the whole band kick in… and remember this song gave birth on Freedom Day. “Deliver Me” is a great song and it has traveled very well. There is now more urgency in the rhythm which is embellished with catchy percussive synth sounds. Michael is more laid back on this final version and the pleasant raspy timbre of “I’m in a crowded room” tells us that the Rock Vocal Master is at work. And that pleasant guitar slide that appeared every four bars in the Miami session is cleverly delayed until it enters with rich electronic treatment to add to the excitement of Michael’s voice in the third verse… “I smell you on my fingertips”. When the chorus finally arrives Andrew delivers the new killer chord to create the necessary harmonic variety. Michael responds with the right melodic shift and the song “Deliver Me” is given wings. The song rides out with the partly repeated choruses “Give me, give me, give me, give me more of the same”. Listen in the closing moments as female soul voices help to carry Michael’s now freer-spirited style to its final climax. “Deliver Me” is delivered and we don’t need any other reasons to understand the addictive exuberance Michael and Andrew experienced together as collaborative composers. Since this article was first published late last year, Andrew Farriss has approved the release of what we will refer to as the “Middle Version” of Deliver Me which was recorded in America while INXS were taking a break from their touring. This Middle Version became a last draft from which the rest of the band based their final London recording session (see Andrew’s interview for the details). The Middle Version is significant in that Andrew has helped Michael re-shape the melody in the chorus by developing the harmonic progression which is the choice and order of chords that are used behind the vocalist’s melody. Listen carefully too to Andrew’s fine electric piano playing that adds an extra layer of rhythm and harmony to the Miami Session. It must be stressed that this is only a raw version which served the purpose of developing the melodic, harmonic and rhythmic aspects of the song. The band would collectively add the icing on top, create the groove and bring the song into a cohesive whole. This Middle Version, which of course was never intended for release, has a noticeable vocal boost a little way into the recording. Thus we are given a unique opportunity to hear Michael’s voice stand out beyond the conventions of a normal mix. Again Michael takes opportunity to experiment vocally. He has most importantly considered dynamic build, and so in the Middle Version he begins in the lower voice register (unlike the Miami raw version where he comes in, guns blazing, in the higher register). Michael won wide acclaim, including high praise from seasoned performers such as Bono, for his ability to perform in the upper registers and it is indeed a hallmark of INXS. But later in his career he started experimenting more with those lower notes which created a laid back feel and soulful sound to his voice. Michael didn’t think he was particularly suited to those lower notes. But his lower register, as in this and the final version of Deliver Me gave Michael more scope to build the song into an exciting climax. See if you can detect where Michael shifts from the lower to upper register in the Middle Version and notice how he intentionally uses both pitch and volume to build tension, creating more variety and contrast to the composition. It is a fine example how Michael Hutchence always worked hard to give us his very best performance. Another fine example of his use of vocal build that transformed his performances into historic moments of rock greatness can be heard on INXS’ Aria Awards performance of “Searching”… So the Middle Version gives us yet another great vocal performance. Once recorded, Michael would take it away and explore new and often very subtle variations until they met in the studio again to record a final version for mastering. Mastering is the post production process of taking a multi-track studio recording and blending it into an attractive dynamic mix that becomes the released version. In this instance the London session became the released version. We hope you enjoy this final addition to our exclusive article on how Michael and Andrew developed a song. It is proudly released to coincide with Michael’s 45th birthday. At what stage do you start making music and begin writing? I started very young but I didn’t ever really set out to be a writer. I didn’t realize what I was doing would later be called an “artform”. I remember having my uncle’s upright piano as a kid. Aside from playing around on it I really enjoyed taking it apart because I liked the sounds inside it. Even back then with a little tape recorder I experimented recording all these odd sounds with piano parts. That was my first dabble with an instrument and then I later taught myself to play the acoustic guitar. The hook-up with Michael Hutchence seemed fortuitous. How did this long time friendship develop into such a powerful and successful working relationship? I can still remember the day Michael stepped off the school bus at Calarney heights. He’d just arrived back from Hong Kong and was still wearing his Hong Kong uniform and stood out like a sore thumb. He was getting bullied and was about to get into a huge fight when I stepped in with my 6ft mate to rescue him. I’ve always hated bullies. But after that first meeting, we really didn’t see much of each other and Michael moved to LA. But when he moved back to Sydney he invited me ’round to look at his bike. We had both developed hugely and I had already started playing in bands. Michael had changed enormously; he was more worldly and interested in poetry – you know, Herman Hesse and stuff. I enjoyed that side of him; his intelligence – all the way through our careers actually. Like everyone else we were interested in music and girls and Michael came down to watch a band I was in and started showing an interest. It was at that point that I suggested Michael put some of his poetry down to music I was writing. This material went under the name “Merlin’s Circle” and the set up also featured two New Zealand brothers. But it was when we formed “Doctor Dolphin” – another early band which featured “Kent Karney and Neil Sanders” – and found “Garry Beers” that we really started enjoying things. Garry had a car and a bass – that was him, so cool, a car and a bass! We got gigs and really started figuring things out. With the formation of our final line-up as the “Farriss Brothers” – and later “INXS” – it was all about playing live and not the recordings. Comments around the time were “They’re too good” or “They play too well”. What the hell does that mean! When did you first realise that you and Michael had the potential to become great collaborative writers? As the years progressed, the partnership that Michael and I had forged was becoming stronger and we were obviously putting the most efforts into the songwriting side, so one day we literally put our hands up and said we were being recognised enough. That’s when the Farriss/Hutchence credits started appearing above simple full band credits. The sabbatical to Hong Kong with Michael in 1987 to compose more material for Kick yielded really great things. What do you attribute that to? I don’t know really. Michael had decided to leave Australia again and, in retrospect, it was kinda like he was rolling up his sleeves and ready to take on the world again. But the making of Kick was full of some very odd moments. I wrote the music to Need You Tonight waiting for a cab to take me to the airport to fly out to Hong Kong. I arrived, played Michael the piece of music and within 2 hours we had the finished track! Actually making the whole album was odd when I look back. We were in New Zealand and the rest of the band were out playing tennis with an A&R guy called Jimmy Hendrix (!) when I first wrote the music for “Never Tear Us Apart”. Odd moments threw up odd things and somehow they all fell into place. Most collaborators share that there is a mutual respect of abilities where one’s weaknesses are another ones strengths. How did you help fashion Michael’s ideas into songs? How did Michael help your musical ideas? We didn’t have a set formula – and that was the key. Sometimes he’d add some lyrics he’d already written to a piece of music I had, sometimes we’d write together from scratch and other times I’d add music to lyric and melody ideas he’d come to me with. We were just solid and very arrogant. We never second guessed each other or ourselves and went with our instincts. It was all very natural and organic. “After Welcome To Wherever You Are” Michael did begin to analyze our relationship a little which hadn’t happened before. And I may not have been comfortable with that at the time, but ultimately it was good and a healthy process to go through. Looking back over the 10+ INXS albums, you and Michael were very prolific – to say the least. How quickly cold your songs come together? As with the “Need You Tonight” example, if things fall into place it could take a couple of hours. Other songs a couple days and sometimes you may get what you were after 15 days later. What You Need is another example of a huge hit that essentially took no time at all. We’d already finished the “Listen Like Thieves” album but “Chris Thomas” (the producer) told us there was still no “hit”. We left the studio that night knowing we had one day left and we had to deliver “a hit”. Talk about pressure. The band’s performance on that track is amazing. We absolutely nailed it. But it is amazing that often the simplest songs – unbelievably simple songs – that take you the shortest time and just happen, are the ones that become the huge hits. But you can spend weeks writing a masterpiece and everyone can think it’s crap! Aside from Michael Hutchence, you’ve written with a wide range of artists from Sir Tim Rice to Yothu Yindi. Contrast the differences. Writing with other people can be easy or hard – it simply depends on the individuals and how things click into place. But Michael just had this great intellect – a real intellectual spark. He had vision and urgency and excitement. There was an enthusiasm borne of the right place rather than something forced. For purposes of this interview, and the featured track “Deliver Me”, the demo shows a lot of passion through the verses, with the choruses and exact rhythms yet to be completely resolved. “Deliver Me” is a loose soul number with some big chops and swaggering attitude even in this early take (with the finished Chris Thomas production a huge musical creation), but when songs are in this uncertain stage, such as this demo, is it clear to you whether it’s going to emerge as fully-formed music piece with everything in place? This demo was the first recording that Michael and I laid down. We were on tour in North America in ’94 and it was literally born out of me fooling around with some synth sounds and Michael just started laying down this very gritty vocal. It’s one chord all the way through and doesn’t change at all. The second recording of the track was done with “Sir George Martin’s son Giles”, and is really out there. It takes things on another step and the song really started to develop but it wasn’t until the final version recorded with the full band and Chris Thomas at the helm that the song really came together. Your future INXS songs obviously won’t be co-written with Michael anymore. How has your songwriting method changed since his passing? I guess I have learned that I need to be a lot more open on what the band and anyone new can make together. I know the onus is on me and my ideas to retain the INXS identity in our sound but on the flipside I don’t want to impinge on anyone else’s input. Ten years ago we published an article on Michael Hutchence’s and Andrew Farriss’ initial writing and recording of “Deliver Me” at Crescent Moon Studios in Miami, Florida. It demonstrated the unique collaborative style of Michael and Andrew as well as offered a simple music analysis of the evolving song. It also celebrated the 10th anniversary of the initial recording session. A further ten years on, and we present another feature on “Deliver Me”. The engineer that night, 27th April 1994, was Scott Perry who has recorded many world-class artists and bands, especially during his residency at Gloria Estefan’s Crescent Moon Studios, the Latin Music hub of the world and home to the Miami Sound Machine. Recently I caught up with Scott Perry working at America’s Golf Channel where he heads up the Audio Department. Scott clearly remembers with much affection the original “Deliver Me” session with Michael and Andrew. Exclusive to Michael’s Official Memorial Site, our interview with Scott coincides with the celebration of the 20th anniversary of Freedom Day* when Nelson Mandela cast his first vote as a free man, and across the other side of the world, the 20th anniversary of the first session of “Deliver Me”. Though in the middle of a hectic concert tour, they took time out to compose and record “Deliver Me”, which would later be included on INXS’s 1994 album release, “The Greatest Hits”. Michael would be delighted that his recording date is celebrated with Nelson Mandela’s 20th anniversary of Freedom Day*. Scott speaks candidly about Michael and Andrew in our exclusive interview. He comments on the contrast in personalities, their friendship and work ethics, sharing technical details for the audio professionals and enthusiasts, giving a detailed account of how the session progressed. He refers to their unconventional recording methods right down to what they had for dinner that night! Incidentally, was it American spare ribs, sushi, Chinese, or Mexican food? You will have to listen to the interview to see how successful as an INXS food caterer you would have been on the night they recorded their first take of “Deliver Me”. *Freedom Day on 27 April is an annual celebration of South Africa’s first non-racial democratic elections of 1994. It is significant because it marks the end of over three hundred years of colonialism, segregation and white minority rule and the establishment of a new democratic government led by Nelson Mandela and a new state subject to a new constitution.